“The Skull of Adam” from Christian Faith Publishing author Larry Herrin is a casual, conversational presentation of essential biblical doctrines drawn from the stories of characters in Scripture. 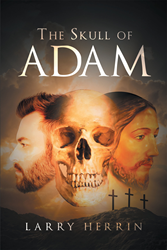 “The Skull of Adam”: a thought-provoking novel intended to inspire further discovery of the significance of the story of Jesus Christ, written thousands of years before He walked on earth. “The Skull of Adam” is the creation of published author Larry Herrin, a retired quality assurance manager for General Motors who was born again at age fourteen. In Holy Scripture, words mean things! Why is the “place of the skull” so important when three of the four Gospels mention Golgotha? It may not be because the rock formation resembles a skull. It may have deeper meaning. Perhaps as some church fathers believed, Adam is buried on Calvary. In this book, that contention is explored. Did Adam lose his significance at his death, or is there a link throughout the Scripture? That may never be known, but the thought is intriguing. The skull of Adam is used herein to present essential doctrines in a casual conversational manner. It is all about the mystery of God. The mystery revealed is that in all times, the Scripture is all about Jesus. Published by Christian Faith Publishing, Larry Herrin‘s new book is a treatise on learning about the historical and prophetic significance of biblical stories in the context of the coming of Jesus Christ. View a synopsis of “The Skull of Adam” on YouTube. Readers can purchase “The Skull of Adam” at traditional brick and mortar bookstores, or online at Amazon.com, Apple iTunes store, Kobo or Barnes and Noble. For additional information or inquiries about “The Skull of Adam”, contact the Christian Faith Publishing media department at 866-554-0919.